One of my favourite dishes. Instead of pumpkin you can use carrots or beetroots (or a mixture of the two) and you can also replace the spinach leaves with watercress if you prefer. Make the labneh the day before you want to serve the dish. Line a sieve with a piece of muslin or a brand new J-cloth and set it over a bowl. Mix the yogurt with the garlic, herbs, salt and pepper. Tip into the cloth, tie it up and refrigerate. The yogurt will lose moisture over the next 24 hours, leaving a firmer, ‘cheese-like’ substance. Help it along by giving it a squeeze every so often. In a small saucepan, heat the regular olive oil, cinnamon, cayenne and ginger. Put the wedges of squash into a roasting tin and pour the spicy mixture over them, using your hands to make sure the squash gets well coated. Season with salt and pepper. Put into the hot oven and roast for 35 minutes, or until tender and slightly caramelized, basting every so often. Put on to a serving dish and squeeze the lemon over. Make the gremolata by toasting the walnuts in the oven for five minutes (keep an eye on them as they burn easily). Now simply chop everything for the gremolata together. Take the drained labneh out of its muslin or J-cloth and gently break it up into nuggets. Put the pomegranate molasses, mustard and salt and pepper into a small jug and whisk in the extra virgin oil. Taste and add the sugar (if using) and lemon; you really have to work on this dressing to get a good sweet-sour balance, so use your taste buds. Using about three-quarters of the dressing, gently toss the spinach, coriander and pumpkin together in a wide shallow bowl. Dot nuggets of labneh over this. 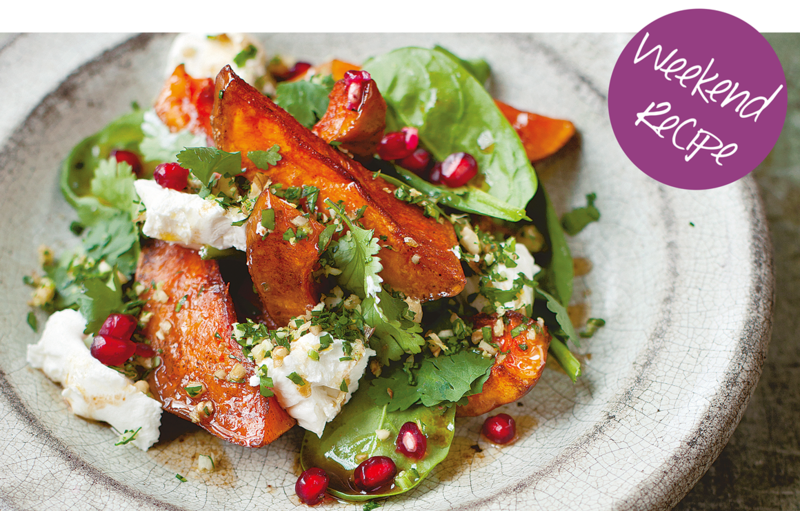 Scatter on the gremolata and pomegranate seeds, drizzle on the rest of the dressing and serve.